AUGUSTA, Ga. – All they wanted was a glimpse of that red shirt. Under a slate-gray sky that foreshadowed storms that (thankfully) arrived later than expected, the 83rd Masters was all over except the shouting. And soon that would be taken care of: the grandest Sunday roar was moments away. Tiger Woods was about to complete what once seemed impossible. Is that a strong enough word? Implausible, preposterous … nothing fully captures just how far Woods had previously fallen or how unlikely this day once seemed. Woods was safely on the 18th green and would soon polish off his first major championship title in 11 years. At the freaking Masters. Flanking Woods was the sea of fans, breathless and sweaty and packed dozens deep around the 18th green, leaning in for a peek at history. It was simultaneously claustrophobic and euphoric. The air smelled faintly of cigar smoke and stale beer. You know how tourists celebrate when the ball drops in Times Square on New Year’s Eve? When Woods tapped in his final putt, it was vaguely like that. Fans thrust their arms in the air. They high-fived. Some cried. At least one couple kissed. “Old Anzine” did not blare through speakers. Coming off 18, Woods first embraced his son, Charlie, followed by his mom, Tida, daughter, Sam, and girlfriend, Erica Herman. A few more fans shed tears. What a scene. Woods, and about 25,000 fans, went crazy after his final putt dropped. It wrapped a super-charged afternoon, and everything kicked up several levels about two hours earlier when Woods, playing alongside Tony Finau and third-round leader Francesco Molinari, reached the par-3 12th hole, the heartbeat of Amen Corner. Molinari teed off first and splashed his shot in Rae’s Creek. Finau followed him into the water. Woods knocked his ball to the center of the green and two-putted. Molinari doubled. Suddenly Woods was tied for the lead. 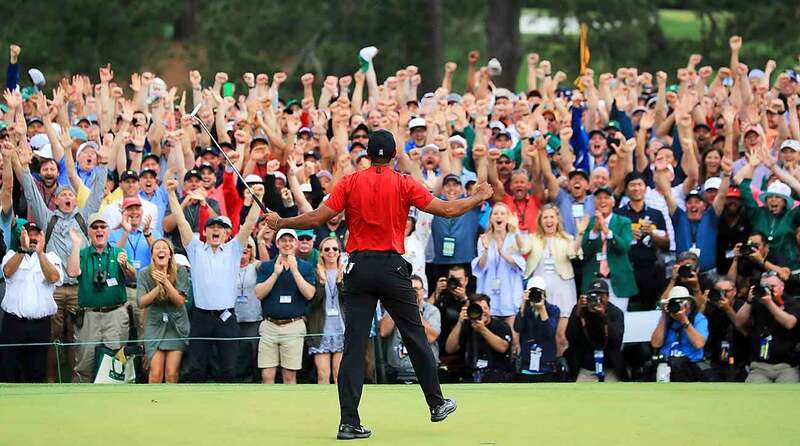 Woods knocked it on to 44 feet, the woman remained safely in the bleachers, and Tiger coolly two-putted to take the solo lead. Fans let it rip as Woods marched to the 16th tee and they went bananas when Tiger’s tee shot dropped onto the putting surface and caught the slope toward the hole. It stopped four feet below the cup, leaving an arrow-straight putt. When he knocked that in, he damn near took down Augusta National with it. “Wooooo!” screamed one man as a big white board behind 17 flipped a red 14 next to Woods’s name. That fan was Bill Artosky of Trooper, Pa., who was attending his 10th Masters. “Just an amazing run,” he said between high-fives. “Just walking by Tiger and seeing his eyes, the steely look – it’s the most focused I’ve ever seen anyone in my life. It was all capped by that scene on 18. When Woods grabbed a 3-wood and piped it down the right side of the home hole, fans scurried up the slope to grab a spot and in all the excitement one golf reporter rolled his ankle on a tree root. (Advil for me tonight!) Most fans wouldn’t get a visual on Woods on that final green, but no matter. Even if you couldn’t see anything, you saw everything. The scene will live forever in Masters lore. When Woods tapped in to kick off the celebration, he marched up the path to the clubhouse with his family as fans serenaded, “Ti-ger! Ti-ger! Ti-ger!” No one will forget it. Afterwards, Woods was asked about the crowds and emotions that carried him home. “It’s special to me. It’s special to my friends and family, and I think that everyone out here who was here got a chance to witness something that was amazing,” he said.